Microprocessor technology programmed to detect Carbon Monoxide levels using Time Weighted Average (TWA) at 10% COHb curves. No False Alarms from new boat smell or outgassing. Full 5 year service life. End of Life clock starts when power is applied, not in inventory or on retail shelves. 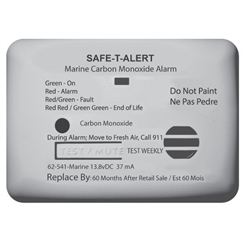 Eliminates nuisance alarms caused by temporary background levels of CO encountered while boating. Memory Scan. Retains the CO level that activated the alarm. After ventilation, it is impossible to know what the CO level was unless your detector has memory. Alarm Mute button silences alarm while boat is ventilated. Rapid recovery sensor resets when silenced or reactivates alarm if dangerous levels of CO remain. Low Current Draw. Innovative micro current circuit saves precious battery power. 37 milliamp (.037 amp.) current draw. 62-541-R-Marine and 62-542-R-Marine include normally closed relay. Use to turn on exhaust fans, remote horns/lights/signals or connect to alarm systems. Available in Flush Mount or Surface Mount. White color standard, black color available upon request. Manufactured by MTI Industries Volvo, IL USA.